Grevillea banksii (dwarf silky oak, ‘garavilea’). This scrubby tree was introduced to ‘bush up’ (embroussailler, in French) what were often perceived as degraded fire-climax grasslands. It covers the most area, in patches along the entire extent of the eastern lowlands. A large woodfuel and charcoal economy has developed around this species, particularly in the past decade, providing significant revenue to two-fifths of villagers we surveyed. Melaleuca quinquenervia (niaouli, paperbark, tea tree, ‘kininin’drano’). This tree dominates a variety of sandy-soiled coastal wetlands, but is also scattered about the hinterlands. 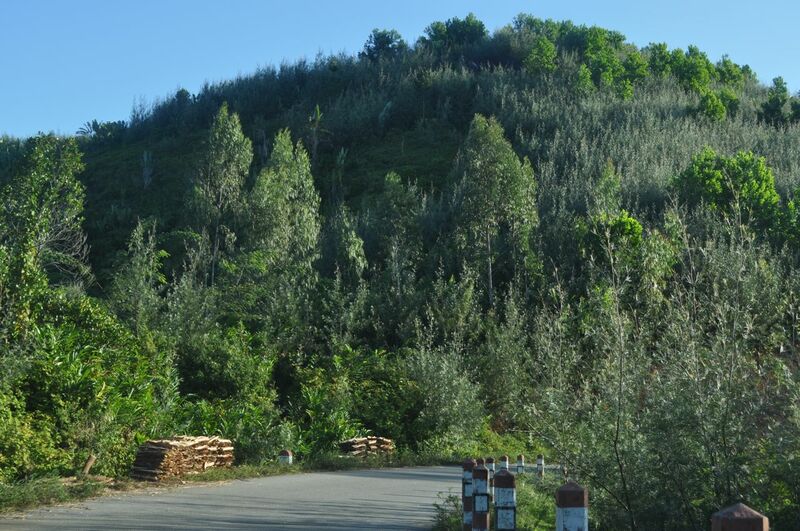 Introduced over a hundred years ago, the main use of the tree is for the essential oil distilled from its leaves: Madagascar provides perhaps one-quarter of the world’s supplies (Ramanoelina et al. 2008). Like in the case of grevillea, former common lands are increasingly privatised to claim these valuable resource flows. Eucalyptus ssp. (‘kininina’, especially E. camaldulensis – the red river gum, and E. robusta, swamp mahogany). Well, what part of the developing world doesn’t have its eucalypts, introduced by foresters and development projects for reforestation, wood supplies, and more, and integrated since long into village landscapes and farmer’s livelihoods (Carrière and Randriambanona 2007). Acacia spp. (especially A. mangium, ‘akàsia’). Another common, and more recent, forestry introduction. The tropical, broad-leaved (phyllodinous) acacias have been promoted for woodlots, agroforestry, and forest plantations. When asked about problems with invasions (plants that are new, spreading, and causing problems), villagers often mentioned this one – not the more obviously invasive grevillea – as it was perceived to harden and sterilize the soil and shade out clove trees. Casuarina equisetifolia (she-oak, ‘filao’). It is not yet known whether the coastal Malagasy populations of this Indo-Pacific tree are native or introduced, and if so, how long ago. It is a frequent sight along the beaches of the east coast, and I include it on this list as the tree has also been introduced from Australia, where it is common, by foresters (e.g. Chaix and Ramamonjisoa 2001). Figure 3 from our article: a photo collage. Row 1: landscapes near Vatomandry, including (left) grassland of type typically replaced by grevillea stands; (middle) dense even-age grevillea; (right) grevillea with Acacia mangium and eucalyptus. 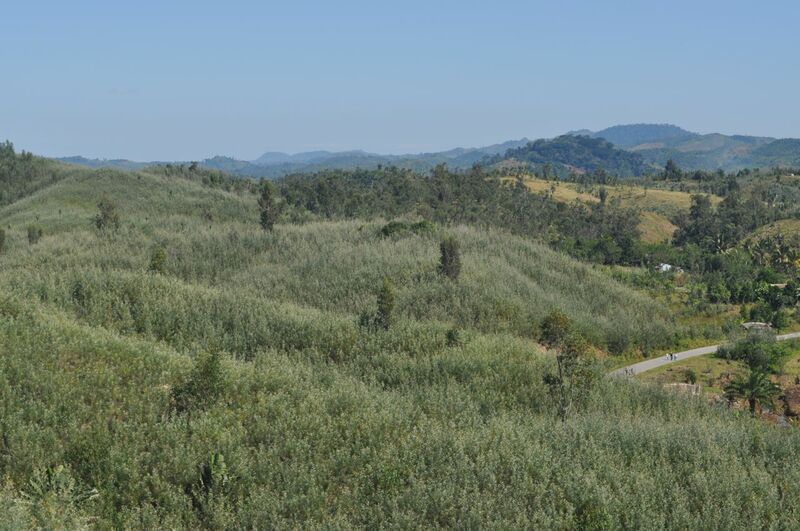 Row 2: Melaleuca landscapes: (left) private property sign; (middle) collectors selling harvest of leaves to essential oil buyers; (right) melaleuca in foreground with Ravinala madagascariensis and eucalyptus. Row 3: (left) agroforestry plots surrounded by grevillea; (middle) cow in former pasture landscape; (right) grevillea stand cleared to create litchi orchard near Vatomandry. Row 4: (left) mature and young stands of grevillea for fuel wood harvest; (middle) interior of tall grevillea stand; (right) grevillea fence poles. Row 5: The charcoal commodity chain: (left) charcoal over and women gleaning leftover coals; (middle) truck loading charcoal sacks; (right) roadside charcoal seller, Toamasina. Row 6: (left) comparing grevillea charcoal with large piece of eucalyptus charcoal; (middle) grevillea fire wood bundles for road side collection; (right) young man transporting grevillea seedlings. Photos by CAK except Row 3 right, by LGR. Each point of view brings with it its own conclusions and recommendations (we also look at researcher perspectives that might see these forests as ‘novel ecosystems‘ or as a case of invasive ‘forest transitions‘). Actual management and policy, of course, depends on local resources and politics, but also on the plants themselves, which continue to grow and are here to stay. This work was based on a productive collaboration with Gabrielle Rajoelison, Aina Radaniela Andrianoro, and Larissa Harimanana. 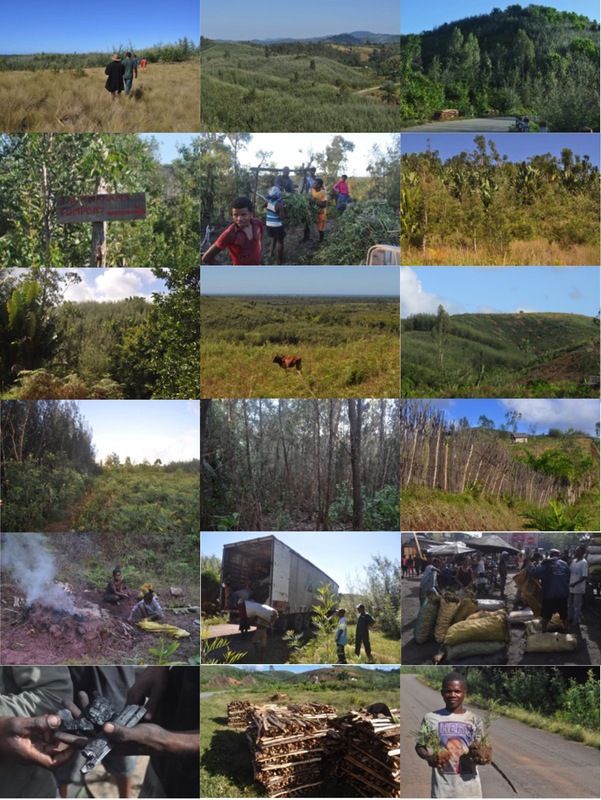 For their masters’ theses, Aina and Larissa did numerous forest transects, social surveys, and key informant interviews in six villages up and down the east coast in 2016; see also my previous blog on my exploratory research fieldtrip in 2014. Funding came from the Australian Research Council (DP130103341), from a project titled “A weed by any other name”, where we investigated indigenous perspectives on weeds in countries around the Indian Ocean. The study authors (and a few scrubby roadside grevillea) after field visits in 2016. Lalanirina Gabrielle Rajoelison (left) is Professor at ESSA-Forêts, University of Antananarivo, and studied techniques for aerial seeding of grevilla in the mid-1980s (never implemented). 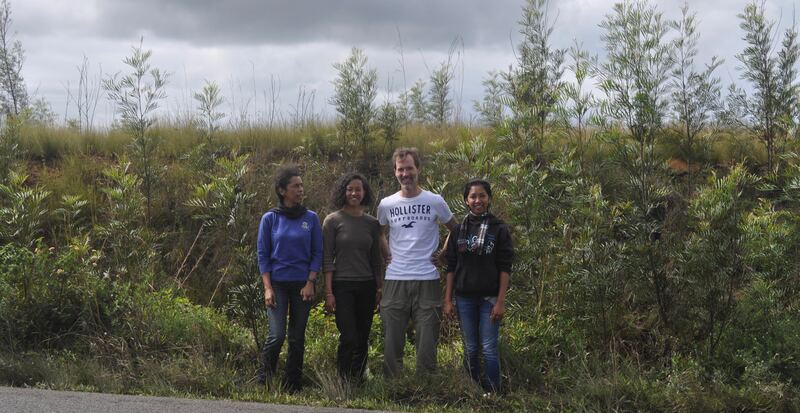 Aina Radaniela Andrianoro (2nd from left) and Somboniaina Larissa Harimanana (right) received their Masters degrees at the end of 2016, after defending their theses on, respectively, the ecological and socio-economic aspects of grevillea forests. This entry was posted on Friday, August 17th, 2018 at 5:52 pm and is filed under Acacia, Introduced and Invasive Plants, Madagascar, Research, Uncategorized. You can follow any responses to this entry through the RSS 2.0 feed. You can leave a response, or trackback from your own site.